I'm on the lookout for projects that I can make for my home, things that catch my eye and make me smile, things that speak to my homemaker heart. You know what I mean? Like this beautiful "Scrappy Plates" pattern by Anne Sutton of Bunny Hill Designs. It's the sweetest Dresden plate quilt I've seen, which could be due to the fabrics she chose or the simple layout - but it gives me goosebumps of delight so I've printed off the free patterns and will think about making it a Friday afternoon 'just for me' project next year. 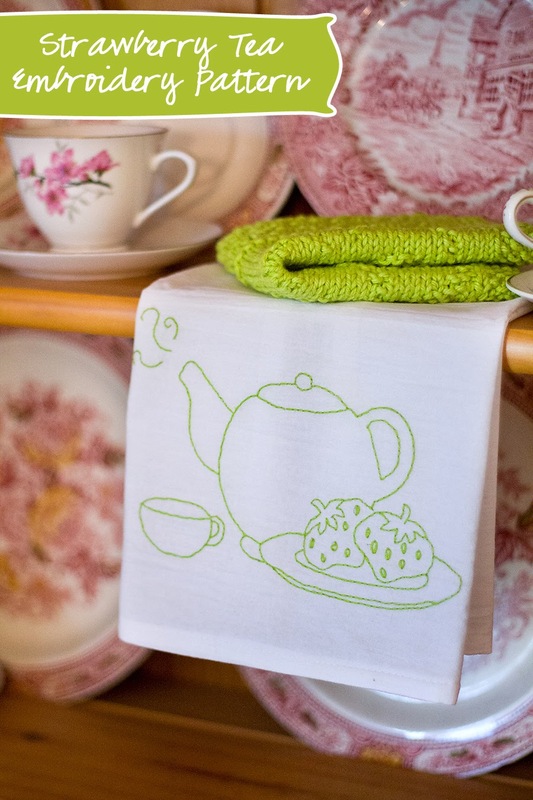 Every January I purchase new kitchen tea towels and I always embellish a few with stitchery, applique or a fabric trim. This cute tea pot embroidery on a tea towel caught my eye on Pinterest so I followed the link and discovered the designer, Carrie of Chicken Soup Designs. She shares this design as a freebie so be sure to thank her if you download it. I'm also going to make a bunch of new scatter cushions for the couch and the bedroom. 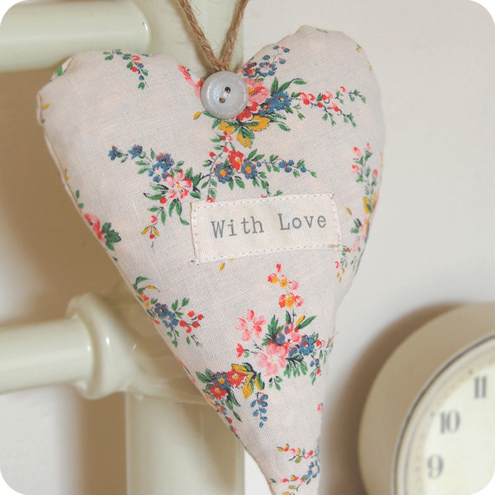 And maybe I'll sew a few hanging hearts like this to hang from drawer knobs? Mostly I want to make simple things, but I like the idea of a Dresden quilt as a feature for our living room couch so perhaps this time next year it will be done if I carve out a couple of hours once a week to devote soley to this project? I hope so. Dresden plates and Churn Dash blocks are my favourites because they add a very homely feel to any room. 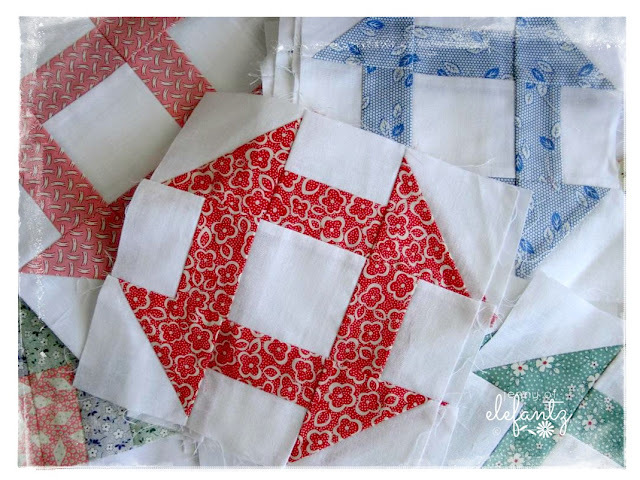 I suppose having said this I should pull out my box of 30's churn dash blocks and finish them as a quilt? I made these in 2009/10...ah, how patient they are to wait for me. I always have the best intentions, but it's the time needed to complete this plan that eludes me. 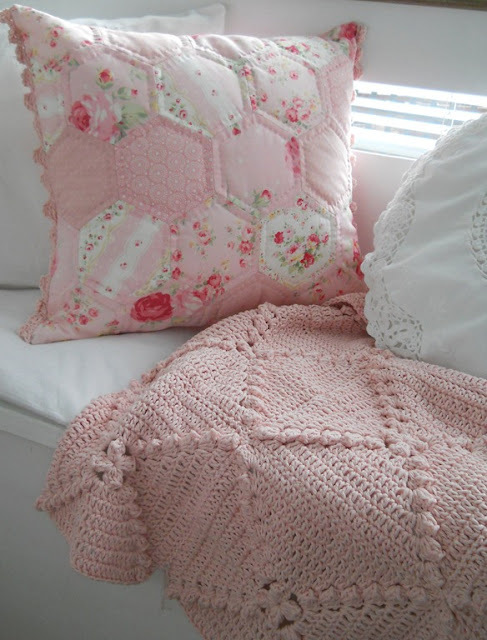 What simple sewing or craft ideas do you have to create a 'homely' feeling within the house? I have a number of mini quilts I mad as part of an internet group and use them as table mats or wall hangings. Lots of variety without handling large heavy quilts. I love the cushions you have shown. Lots of beautiful projects Jenny. The fabrics in your churn dashes look great sew good luck with finishing it. I want to embellish my house. I like simple and complicated patterns. So I will take a while. :) Have a good day. Thank you for all the links to these special projects. Love how 'patient' your churn dash blocks have been - my WIP's too :)! I have been decorating my house with a lot of table toppers, for end tables, dressers, coffee tables etc. Each time I see the fabrics used - I smile. The Dresden Plate Quilt and Tea Towel is really cute. 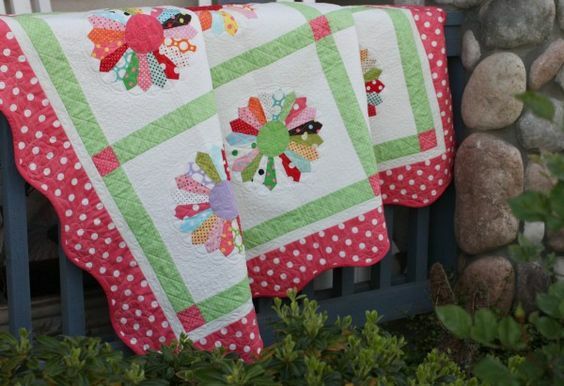 Those things are so pretty; I like that quilt too! The thing about making pretty things for our home homes... our homes then reflect our true selves... not just generic things from the big box store!! I love all of your ideas, Jenny, but especially the pillow with the lace piece, and the hexi pillow. 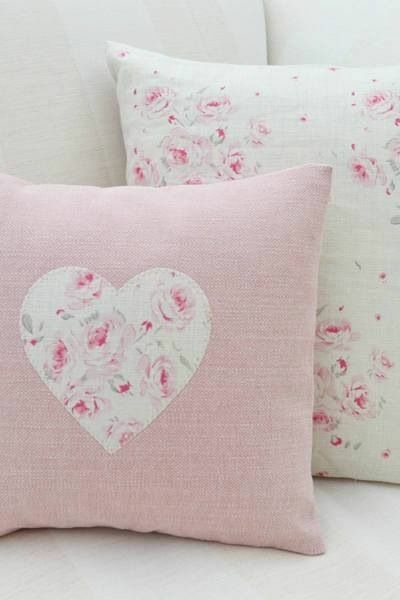 I've been wanting to make some pretty pillows for my bedroom, and they would be perfect! I love the Dresden quilt and the teapot especially, so thanks for those links. Maybe stitcheries in the centers of the Dresden plates? I'm making one like that for fall. 9 blocks and so far I have one complete. LOL Not this fall, evidently. I like to have a few pillows around, and there are things hanging here and there that friends have made for me. I don't have all that much, because I need to clutter everything with books and stitching supplies! Love the Dresden quilt and you are right the lime teapot rocks. That quilt does look pretty. The spotted border really sets it off. It's funny how I always like pictures of rooms & things in pink yet I can't bear pink things in the house. It always looks good in other people's houses but not in mine. I once had a pink loo & basin in the the downstairs toilet & couldn't wait to get rid if it. Took 15 years! Also didn't like my daughter's pink & cream bedroom. It's been blue since she left home. It's cream now for Lauren with the odd touches of pink for her. I compromised. 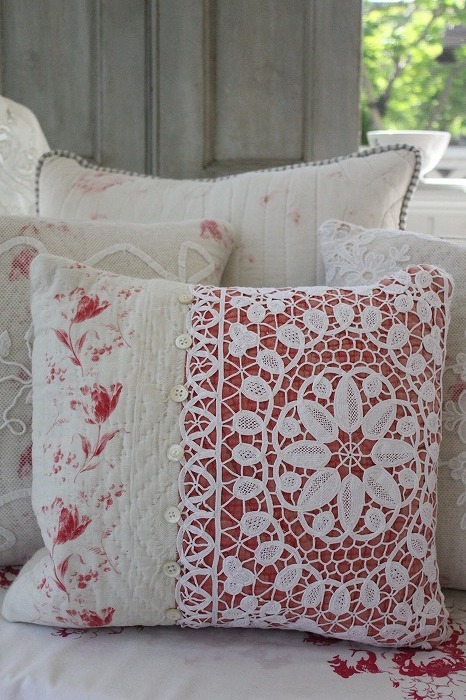 I love that red & cream lace lace cushion. I could certainly live with that.